Gushing life forces make spring continually amazing. And the more we know about our universe the more amazing we realize life is. NASA recently stated that finding extraterrestrial life is part of their 20 year goal, that is in fact to identify traces of microbes on Mars. Meanwhile our blue planet, gorgeously shining in space, is it for now. The dazzling effect of life forces makes our meaning questions even more confronting. Those questions of life don’t come simply through an intellectual route. The encompassing forces of life also work continually through us. And at the inmost crossroad of our being we may sense a flow and yearning of creation that seeks to express and assert itself. And there we may sense a connection with the transcendent force of God’s Spirit. Taizé spirituality deftly guides people toward that crossroad of life. The simple lyrics and meditative chants of the Taizé tradition accompany participants to an encounter with God’s presence and the beauty of the risen Lord in a reverent and grateful mindset. 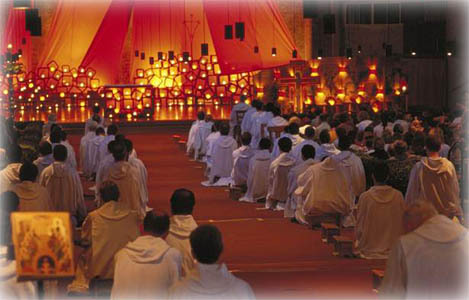 What the Taizé spirituality helps to highlight is an aspect of our faith that we celebrate during this Easter season. The presence of the risen Lord is not simply a notional aspect of our faith. The sustaining, comforting and guiding presence of God is seeking to refresh us daily.